VISITORS - Valerie Leed (Bruce Johnson’s student 40 years ago in eighth grade! ), Renee Biesel (Charles Mortimer); Becky (Mathilde Schmidt), Susan Valente (Bonnie Best and District Conference Chair), and Bill Mulgrew (Executive Director, Castro Valley Chamber of Commerce). SAL TEDESCO MEMORIAL HELLO SONG - Dan Willits with gusto! 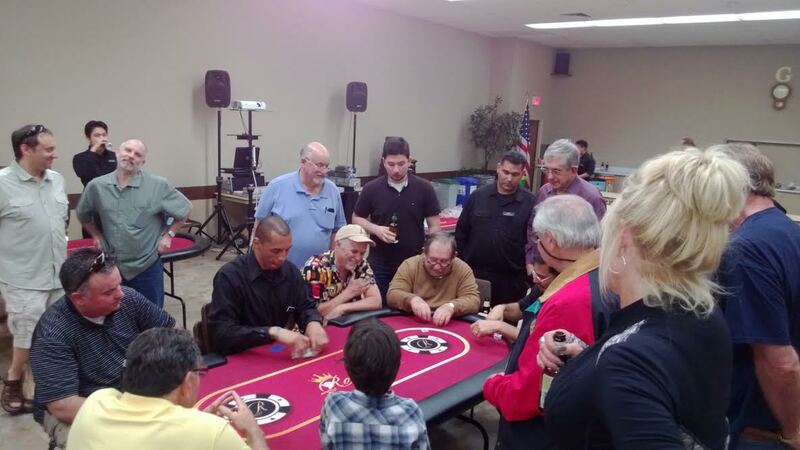 REPORT ON TEXAS HOLD’EM - Chair Al West reported that we netted between $8-10,000 and announced Bill Jarvis WON the tournament! Al thanked Dan Willits (food), Hafsa Burt (Re-buys and Add-ons), Cliff Sherwood (wine); Bobbie Aufdermauer (cookies), Randy Vanderbilt, Mark Pontiatowski and Dawn Ortiz (prizes), Dwight Perry (who did everything Al did not want to do!). Please look for updates on upcoming events below: Pancake Putt-Putt, Chili Cook-off and Parade! APRIL 11-13 - DISTRICT CONFERENCE, The Dolce Hayes Mansion, San Jose. Part of the celebration will be remembering Rotarians from our District who have passed away this year, including our precious Mr. Short and Mr. Tedesco. Please be sure to register by March 31 . . . Susan Valente, District Conference Chair, promoted registering by March 31 to possibly win a football signed by Dwight “The Catch” Clark of 49er fame. MAY 9 - CHILI COOK-OFF - Rowell Ranch Rodeo Grounds - Prizes are $500, $200 and $100. Repeat - We will need a new chair for next year since kern will be President-Elect. MAY 10 - ROWELL RANCH RODEO PARADE - May 10 - Rowell Ranch Rodeo Parade - Theme “Castro Valley Rocks!” Co-Chair TL Baily confirmed that we WILL have the Wells Fargo Stagecoach this year! PROGRAM - Our program today was our very own KJ Page speaking on “What’s It Like Out There.” KJ painted a very, very realistic picture of what we are all facing in the future along with some very hard facts to hear, including that only the District of Columbia and New York have higher poverty rates than California, and that 21% of children live in poverty. The cost of growing old is expensive, too, as Assisted Care costs $900-9000 per month; skilled nursing costs $10,000+ per month; a bonded-licensed helper is around $22 per hour; and an RN can run $50 or more per hour. She also stressed all of us having an Advanced Directive that will relieve our families from having to make some very tough decisions (download: http://coalitionccc.org). Also KNOW what your Long-term Health Care Policy actually covers: skilled nursing, custodial care, etc.). Tremendous presentation! Thanks, KJ! LOOKING FOR THE WHITE MARBLE - With $74 and 12 marbles, Charles Mortimer reached into the sack and won . . . $5! Apr 1 - Connie McCabe, Meals on Wheels.